Engaging, effective communications training, bursting with useful and practical information! "The training had such a refreshing and relaxed approach and I can remember more from it than any other training I've ever done." A collection of videos to be enjoyed on the move or at your desk, guaranteed to sharpen up your communication skills. 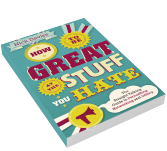 A book containing all the stuff I bang on about.